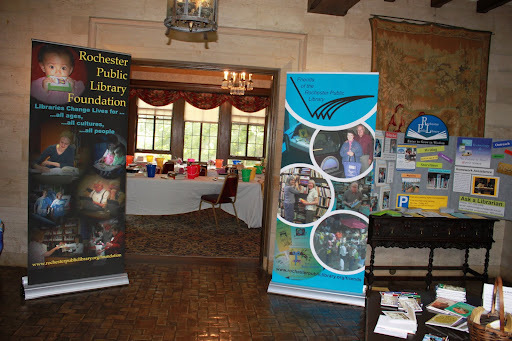 The Foundation and Friends of the Rochester Public Library held two fundraisers in the Plummer House on August 9th. This was a perfect venue, wonderful gardens and even the weather cooperated with sunshine and cool breezes! We had specific goals in mind, as the library needed to replace a children’s computer station and cd/dvd cleaning equipment needed updating. We were able to raise funds towards both projects thanks to our loyal supporters and patrons. Plus we all had a great time! 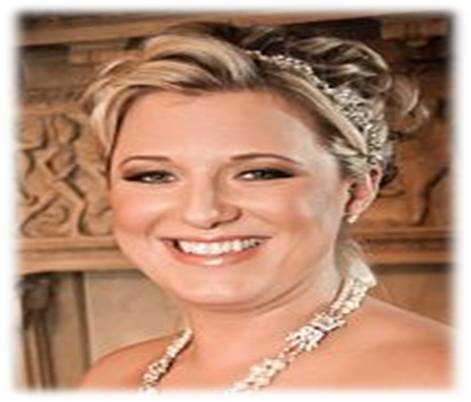 Both events have photo albums on our facebook page. 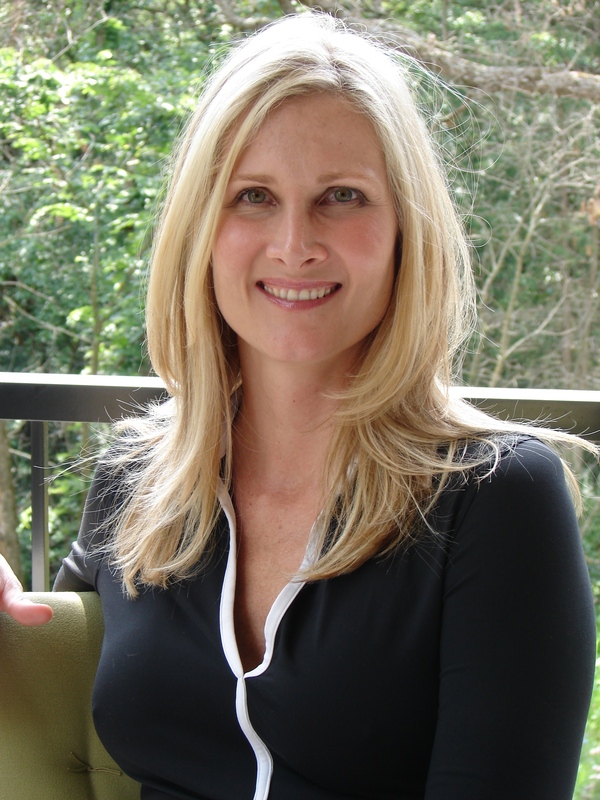 The first event was Cool Reads for Hot Days, as an ice cream social with a local author Elissa Elliott who provided great discussion points with her recent book Eve, and her new writings. We appreciated that she donated books for door prizes. There were wonderful silent auction items and bucket raffles of books as well. We also showcased some new items of Library and literary stationary, notecards, notepads, notebooks and matchbook pocketbook notepads, many handcrafted from re-purposed books. A lovely Friend decorated both events with flowers from her garden! These were transferred to and graced the Library. 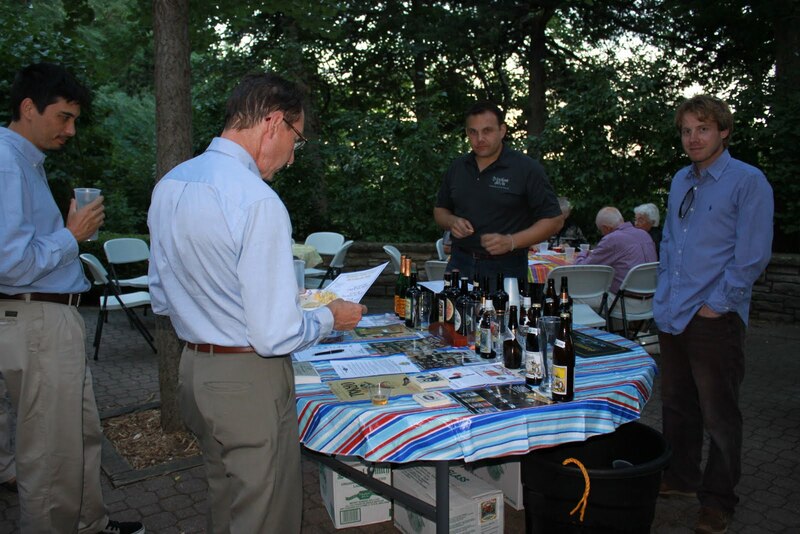 The second event, Brews and Clues, was held in the evening with local author Paul Koeller talking about his family experiences in the brewing industry in Wisconsin. It was a fascinating informative talk, and not nearly long enough, but there was beer to sample! Over 40 different types, with some lovely casual foods (huge thank yous to Andy’s for the RootBeer and welcoming Beer, Coldstone Creamery for the icecream, Just Rite Foods for the Cheeses, Trader Joes for the pizza) and the Friends who both provided nibbles and smoothly ran the event! Paul also donated a book for a grand prize, as well as part of the proceeds from his book sales that evening. Please note that he also supports a college scholarship with the rest of his proceeds. Several other local business supported this event through the silent auction (see our album descriptions). We hope to make this the FIRST ANNUAL event, and that we will see you all next summer. The Library needs our support, and you get to have a lovely time! Each beer sample is a 2 oz pour so you will be able to pick a number of samples. This is an opportunity for you to discover new beers and new tastes at a fraction of the price of each beer. Some of these beers go for $15/bottle! *Some people think three is a crowd but for us, three is the magic number. Purchase two tickets for the event and you can bring your very own designated driver who will get their fill of 1919 root beer, a wine spritzer, or other soft beverages. This is a special opportunity for online ticket sales since we are not advertising this anywhere else! The deadline for early bird registration is Friday! Register now! No tickets are given out, when registering, please provide full names for your entire party (even your designated driver) for the list at the door. This Library fundraiser (through the Friends and the Foundation) is to help purchase a new/replacement children’s computer. We have a very active Children’s division, accounting for 35% of the total library circulation. In addition, last year alone, over 15,645 children and parents attended various programs. The library’s programs and materials help young children learn important pre-literacy skills so they can become good readers and succeed in school. We currently have 3 well-loved Little Tikes computers in Children’s that are in constant use. Oftentimes, children are vying for position. They have only learning games on them with appealing characters and bright colors–game titles include: Millie’s Math House, Trudy’s Time and Place House, and Sammy’s Science House. The computer station itself is attractive, with brightly colored child-sized components including: small mouse, lightweight child bench, and a flat child-friendly keyboard. The “house” for the computer system is made of a tough, durable plastic that can stand up to long-term use (over 7 years). Our two oldest computers were worn out from constant use and replaced by generous donations. We currently have a 3rd unit that we would need to update. The picture shows the appealing unit. Please help us achieve this goal. If you cannot attend our Cool Reads for Hot Days icecream social, please consider making a donation. We appreciate your efforts. The Rochester Public Library Foundation is holding a summer fun”d”-raising event. Join us at the Plummer House for a casual mysterious beer-tasting event. $30.00 in advance $40.00 after August 5. August has few literary events associated with it so we decided to create our own. Somewhat to our surprise other organizations have been pairing beer and literature for some years now. Here is your chance to celebrate various mystery authors born in August while discovering a wide selection of brews, some of which have been featured in classics. You may register online or by mail to secure your spot. Space is limited to the first 75 people who register. Are you attending? Facebook it!